I first found this idea on Filth Wizard but my son wasn’t quite at the stage her children were so I simplified what she did to fit our needs better. Still in the end it all boils down to putting stickers on Lego or Megablok toys to create word and/or sentence builders. In the original post on Filth Wizard she used plain white stickers and wrote letters and words on them. To be quite honest, I hate my penmanship. Years upon years of practice have not shown much improvement. So instead of using my chicken-scratch writing to write out letters, I took the opportunity to purge my craft drawer of some alphabet stickers that were left over from previous projects. You might note in the picture that I have made the vowels a different color to highlight that they are special letters. We also have a good mix of both upper and lower case letters. We’ve used our set to practice copying words that we’ve read in books, to practice spelling LittleMan’s name, to match upper case to lower case letters. Most recently we’ve begun using it to sound out small words and jump-start discussions about phonics in general. For this I usually put one letter on the big red block, we say the sound of the letter, I add another letter, then we say the sounds of the letters as they are added. 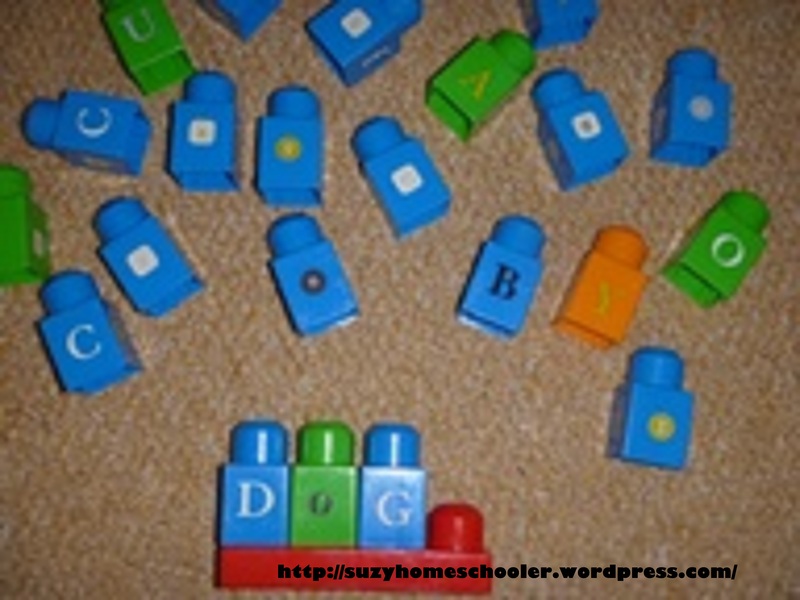 Its been good practice not only for letter recognition but also in blending of letter sounds. As a side note, even with the stickers, the blocks are still usable for the original intended purpose of building. Which is fantastic because SunnyGirl has recently taken an interest in her big brother’s lessons. Now they can sit side by side playing with the same toys, but both learning something developmentally appropriate for their age.